More than 300 information professionals from 26 countries gathered in London last week at Internet Librarian International. Kate Torney opened the conference with a keynote that was described as a “fantastic”, “brilliant” and “inspiring”. Torney, formerly Director of News at the Australian Broadcasting Corporation and now CEO of Australia’s State Library Victoria spoke passionately in praise of libraries. Libraries are ahead of the pack on digital disruption, and are good at sharing and learning within the profession, said Torney, but in today’s competitive funding environment we need to be better at publicly celebrating our digital transformation and sharing our libraries’ stories: “the strength of our narrative together strengthens all of us.” Libraries provide space for users to stop, think, and create – vital in today’s knowledge and creative economy. 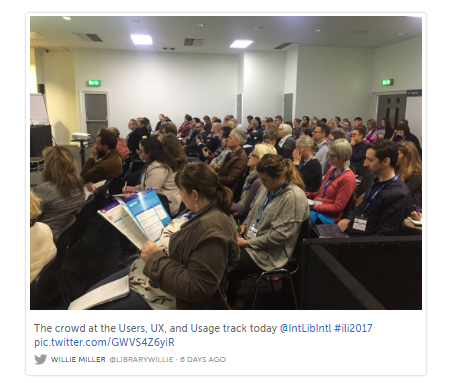 As one delegate tweeted, “Innovation is the thread that ties all the case studies of #ili2017 together”, and attendees were able to explore six tracks focusing on opportunities for library transformation; users, UX and usage; the creative use of content and collections; marketing the library; new scholarly communications; and the role of libraries and information professionals in the ‘post-truth’ world. 'The New Library, The New Librarian’ track included sessions on empowering the digital citizen and new tools for transformed library teams as well as looking at the phenomenon of 247 library opening with case studies from Denmark’s Allerød Libraries, and De Montfort University in the UK, who have done just that. The very popular ‘Users, UX and Usage’ track took a look at user-driven space planning, and learning from user experience. The ‘Content Creativity’ track explored collaborative collections and mobilising content on a shoestring, as well as taking a look at new university presses. Other highlights of Day 1 included a visit by groups of new info pros from the Future Library & Information Professionals Network, and the New Library Professionals Network. As they take their first steps in their information careers, members of these two networks were invited to attend ILI to take part in a specially devised workshop ‘How to be an information professional in the 21st century’ and to join in with the main conference sessions. Day 1 concluded with a packed and lively reception in the Sponsor Showcase where delegates and speakers continued the conversations of the day over drinks. Day 2 opened with a keynote from David White, Head of Digital Learning at the University of the Arts, who examined the crucial role that libraries and librarians play in connecting information, ideas, disciplines and people. White suggested that librarians are the ones who ‘draw the lines’ to connect scattered facts in the era of Google (whose strapline could be “Think less – find more”) and social media (‘think less – get told more”). Users need to know that librarians are experts in evaluation, navigation and curation: the library is “a cultural signifier of expertise in seeking truth”. Day 2 highlights included the ‘Fight the Fake, Find the Facts’ track, which featured a panel debate bringing together Matt Benzing from Miami University in the US, Ingeborg Rygh Hjorthen from the Norwegian Broadcasting Corporation/ Faktisk.no and Krystal Vittles from Suffolk Libraries in the UK to discuss the fake news phenomenon and its implications for information professionals. The Marketing the Library track featured a well-received session which explored how librarians are taking advantage of the surge of interest in podcasting and digital radio to market their library services, with case studies on the Librarians Aloud! DIY podcast; University College Cork’s use of a live music radio show; and the University of Sheffield’s 24 Hour Inspire pop-up radio station. Finally the New Scholarly Communications track looked at ways that info pros can develop the support that they offer to their research community. Andy Tattersall of Sheffield looked at the modern research cycle, with new roles including the digital academic specialist, while Danny Kingsley and Claire Sewell of Cambridge University Library shared challenges and triumphs from the Cambridge Office of Scholarly Communication. ILI 2017 took place alongside Taxonomy Boot Camp London. The two events together welcomed over 450 information professionals and the events featured a sponsor showcase and the support of seventeen industry associations and networking groups. ILI 2018 will take place on 16-17 October 2018 and will once again be at London’s Olympia Conference Centre.